The city was formed on February 18, 2002, by the merger of the cities of Chicoutimi, Jonquière, La Baie, and Laterrière, along with the municipalities of Lac-Kénogami and Shipshaw and part of the township of Tremblay (Wikipedia). 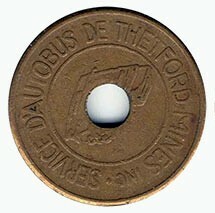 Bus service operating between Chicoutimi and Jonquière, 4 round trips/day, 50¢ fare (CR&MW August 1926, pp. 440-441). By March 1928 was operating a fleet of 8 buses and 11 sedans over a network of six suburban and intercity routes, (1) Chicoutimi - Arvida - Jonquiere - Kenogami, (2) Alma - St. Bruno - Larouche - Jonquiere, (3) Chicoutimi - Riviere de Moulin, (4) Chicoutimi - Laterriere, (5) Chicoutimi - Grands Baie, and (6) Chicoutimi - Radin - Jonquiere (CR&MW April 1928, pp. 231-232). Also operated under the name Autobus 500 Ltée. (Jean Breton 2009). Affiliate of Provincial Transport Company (See Banlieues de Montréal). ( Canadian Coach 1971, Dawes et al. 1972, JM 1997, Jean Breton 2009). ( Transit Canada 1976 cites an unnamed private operator). Name changed in coordination with municipal amalgamation. (photos busfanplace.com, David A. Wyatt). CR&MW (December 1928, p. 745) reported that A&T lodged a complaint with the local regulatory commission about unfair and unregulated jitney competition. Jitney operators mentioned include: Joseph Bergeron, Albani Thibault, John Langois, Guay and Gagne, and Gagnon. An electric trolley freight line was opened in 1910 by la Compagnie de Pulpe de Chicoutimi connecting the mill in Chicoutimi with a track junction at LaBrosse. The line was acquired by la Compagnie de Chemin de Fer Baie des Ha! Ha! in 1911 which became the Roberval & Saguenay Railway in 1914. The electric line was dewired [date unknown] and later abandoned [date unknown]. It seems unlikely that the line operated regularly scheduled passenger service but further research is required. (photo www.trainweb.org). 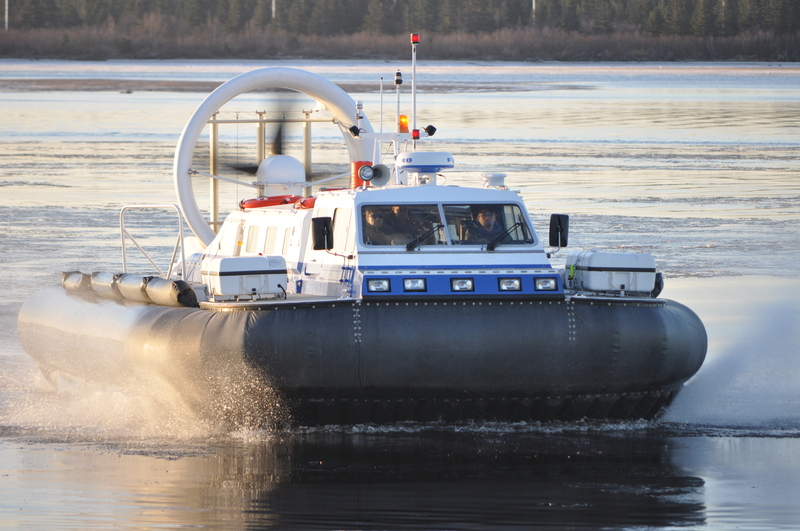 Hovercraft-operated ferry service between Pakuashipi and Saint-Augustin on opposite shores of the Saint-Augustin River. Vessel named L'Esprit de Pakuashipi. Nine round trips/day are operated. Fare is free. In winter [September to April] travel by ice road or private snowmobile is possible. (STQ website, CPTdb). Commuter-scheduled weekday service between Saint-Donat and Sainte-Agathe-des-Monts where connections with CRT de Lanaudière for further travel to Mont-Tremblant and Saint-Jérôme can be made. Operated by Transport collectif Saint-Donat. (website 2010). A funding partnership to establish a taxibus public transit service in Saint-Georges was announced 27 June 2011. ( Edition Beauce 27 June 2011, press release, website 2012). City service from 1947. Abandoned transit service in Saint-Hyacinthe at the end of 1953. (Jean Breton 2009). Bus service between Saint-Hyacinthe and Sainte-Rosalie. Sold to CTM 1961. (Jean Breton 2009). Three weekday round trips between Saint-Pascal and La Pocatière via Saint-Philippe-de-Néri and Saint-Pacôme, funded primarily by MRC de Kamouraska and operated by Trans-apte. Requires booking 24 hours in advance. (website 2011). Local transit service in Saint-Jean-Sur-Richelieu. It's not entirely clear when this became separate from CIT Le Richelain or whether or not it was ever formally part of the CIT. Contract operator in 1993 was les Autobus Boulais Ltée. Contract operator in 2009 was Veolia Transport Inc. (Jean Breton 2009). Operated under contract by Transdev ( Street Side Guide 2015). (photo Jacques Matte). Taxibus program providing local transit service in Salaberry-de-Valleyfield. Principal operator is Taxi Venise. Assumed operation of former exo-Sud-Ouest route 99 21 January 2019. As of January 2019 service contracted to three taxi companies: Taxi Venise, Taxi Valleyfield and Taxi Soulanges (website 2019). (website 2010). 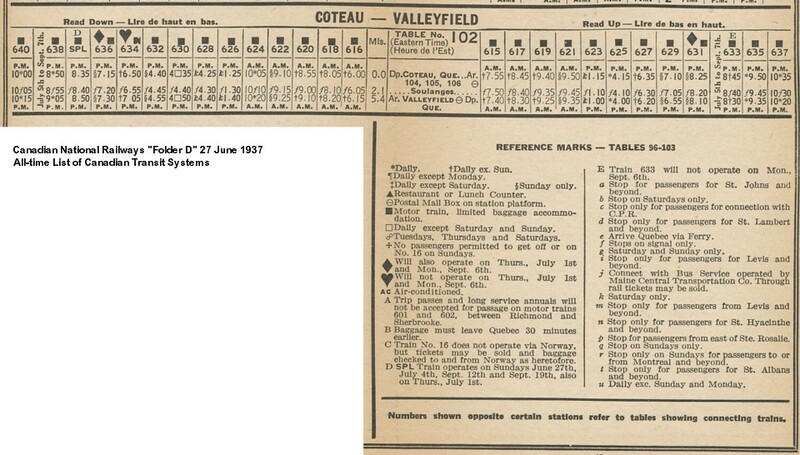 The Canadian National Railways timetables for the summer of 1937 include frequent motor train service between Valleyfield and Coteau [8.6km/5.4mi], typically eight round trips per weekday. Whether this facilitated commuting to Valleyfield from Coteau or was aimed primarily at connecting Valleyfield with through trains at Coteau is not known. ( Canadian National Railways Folder D effective 27 June 1937). Sept-Îles amalgamated with the communities of Gallix and Moisie in 2002. Clarke City was annexed to Sept-Îles in 1970. (Wikipedia). Local bus service connecting Clarke City, Sept-Îles, and Moisie. (Jean Breton 2009). Operation owned by by Eddy Eslinger, Yvon Bouchard and Robert Nadeau. City bus service in Sept-Îles. Acquired Côte Nord 15 November 1954. (Jean Breton 2009). Service in Sept-Îles and to the airport, Clarke City and Moisie. From 18 January 1955 Sept-Îles city service consisted of four routes. Also operated intercity routes to Rivière-Pentecôte, Franquelin, and Baie-Comeau. City service in Sept-Îles abandoned 1963. Company bought by T.E.S.I. Saguenay (1974) Ltée March 1974. (Jean Breton 2009). 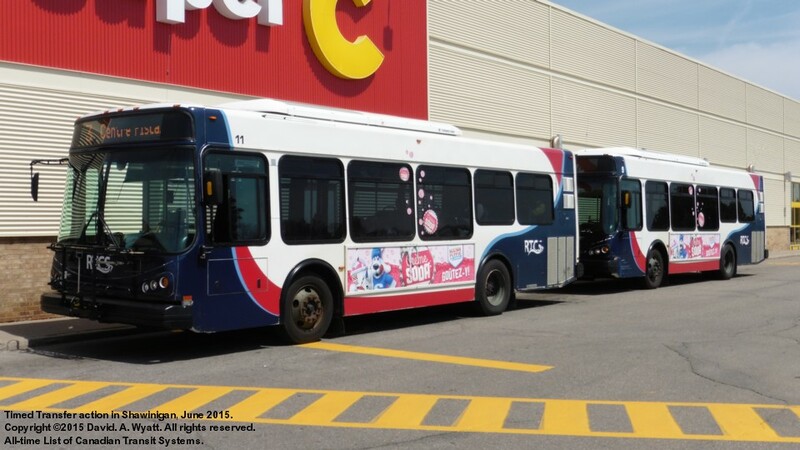 Single-route service in Sept-Îles anchored to a local shopping centre. Service transferred to Desrosiers 1971. (Jean Breton 2009). City service transferred to Arnaud 1972. (Jean Breton 2009). City service transferred to T.E.S.I. Saguenay 1974. (Jean Breton 2009). Acquired Autobus Sept-Îles March 1974. Sold local service to Littoral 1983. (Jean Breton 2009). City service abandoned circa 1988. Company sold to Groupe Viens 2001. (Jean Breton 2009). Weekday transit service between Sept-Îles and Port-Cartier initially announced as four round trips per day. Administered by Corporation de transport adapté de Sept-Îles. Service is public but geared towards students of the CÉGEP de Sept-Îles [Sept-Iles collegiate]. (online schedule 2011). 01 January 2002 the City of Shawinigan was reconstituted as the amalgamation of seven previous municipalities: Shawinigan, Grand-Mère, Shawinigan-Sud (Almaville prior to 1948), Saint-Georges-de-Champlain, Lac-à-la-Tortue, Saint-Gérard-des-Laurentides, and Saint-Jean-des-Piles (Wikipedia). Operation bus service between Shawinigan and Almaville [Shawinigan-Sud]. Sold 1948 to C&F. (Jean Breton 2009). Founded in 1922, C&F started city service in Shawinigan in 1945. When C&F sold intercity operations to Voyageur 1970 Shawinigan city service was transferred to Carier-family owned TStM. (Jean Breton 2009, Luke & Metler, p. 49). Carier-family owned business. City service abandoned 1975. Another family-owned enterprise, Service d'Autobus de la Maurice Ltée, provided intercommunity service connecting Shawinigan, Grand-Mère, and Trois-Rivières 1970 - 31 December 1975. (Jean Breton 2009, Canadian Coach Vol. IX, No. 6, November/December 1973). Operating school buses in the area from 1969. City service from 1975. (Jean Breton 2009). In the 1980 telephone directory ASLtée describes itself as urban service between Shawinigan, Grand-Mère, and Trois-Rivières (RS). City service abandoned 1983. (Jean Breton 2009, Jacques Matte 1997). City service started 1984. Became contract operator for RITCCM 1986. (Jean Breton 2009). City service in Shawinigan, Shawinigan-Sud, Grand-Mère and Saint-Georges-de-Champlain operated under contract by Autobus LPR Inc. (Jean Breton 2009, Jacques Matte 1997, RS 1994, photo Jacques Matte). November 2002 LPR becomes owned by Groupe Dostie and the operating contract in Shawinigan is transferred to another Dostie entity, Transport Urbain de la Mauricie. From 01 July 2019 contract operator will be Autobus Fleur-de-Lys. (Jean Breton 2009, photo David A. Wyatt). According to the 1907 CPR timetables, the St. Maurice Valley Railway operated a daily except Sundays train service between Shawinigan Falls and Trois-Rivières (21 mi./34 km, 75-90 min.). Commuters arrived in Shawinigan Falls at 8:45am and departed for Trois-Rivières at 6:45pm. This meets a basic definition of a commuter train (weekdaily, rush-hour scheduling and run time under about 90 minutes). The StMVR leased by the Canadian Pacific Railway Company 1911 (and amalgamated with it in 1958) (Andreae 1997). Owned by Mrs. J.L.O. Bonin. City service in Sorel, Saint-Joseph-de-Sorel, and Sainte-Anne-de-Sorel. Service extended 07 October 1947 to Saint-Pierre-de-Sorel. Incorporated as SBT 1948. (Jean Breton 2009). Same ownership as Sd'AB. (Jean Breton 2009). Private operator. (Jean Breton 2009, Dawes et al. 1972, Canadian Coach 1973, Transit Canada 1976?, Jacques Matte 1997, photo busfanplace.com). Part of the Groupe Gaudreault of Joliette. City service abandoned 1988. For a few months in 1991 transit service was operated, sponsored by local shopping centres. (Jean Breton 2009). Taxi-bus service in Sorel-Tracy and Saint-Joseph-de-Sorel. Managed by CIT Sorel-Varennes. 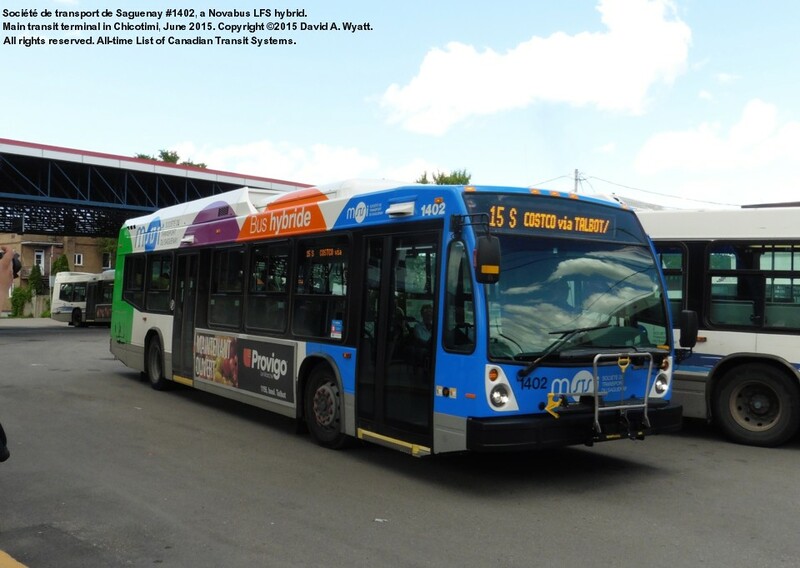 Additional service provided by local stops on CITSV commuter services to Montréal. (Jean Breton 2009, CITSV website 2009). Frequent (typically every 30-minutes) ferry service between Sorel-Tracy and Saint-Ignace-de-Loyola, a 10 minute trip. Prior to 1978 the ferry was privately operated by Lucien Lachapelle (STQ website 2015). (website 2011). Tokens exist for an operation of this name (see image right). Further details required. Taxibus public transit service. Use requires advance booking. (website 2011). Modern Val-d'Or was created 01 January 2002 by the amalgamation of Val-d'Or, Dubuisson, Sullivan, Val-Senneville and Vassan. Started local city service in Val-d'Or 1947. Sold 1948 to AGCM. (Jean Breton 2009). Local service in Val-d'Or and between Val-d'Or and Bourlamaque. Operations incorporated 1950. (Jean Breton 2009). Added service to Lemoyne Beach 01 June 1950 and to Val-d'Or airport 24 November 1950. Airport service abandoned 31 October 1956. Remainder of local service abandoned 1958. 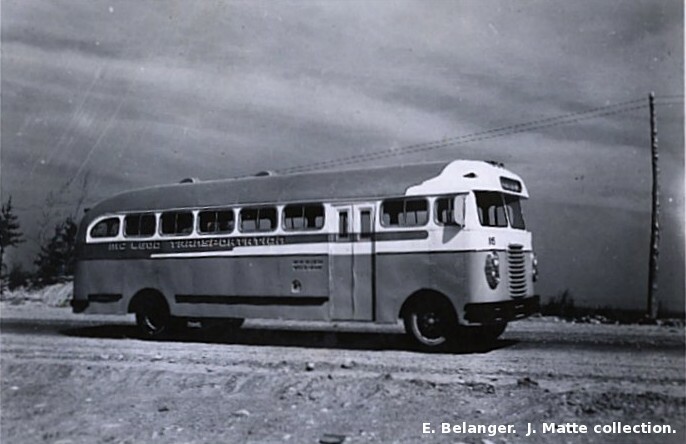 Company sold 26 April 1960 to la Compagnie d'Autobus et de Camionnage de l'Abitibi. (Jean Breton 2009, A. Bélanger through JM 1997, photo E. Bélanger, G. Bélanger collection, courtesy J. Matte 2008). Local service in Val-d'Or and between Val-d'Or and Bourlamaque. (Jean Breton 2009). Assumed operating permits from AGB 1970. Company sold to AM 1981. (Jean Breton 2009, RS). Bourlamaque annexed to Val-d'Or in the 1980s. Local service ended circa 1992. (Jacques Matte 1997, Jean Breton 2009, Transit News Canada 1984). Taxibus service sponsored by the municipality and operated by contractors. Service extended to Sullivan 13 January 2003 and to rural areas of Val-d'Or (Louvicourt, Dubuisson, Vassan and Val-Senneville) 16 June 2003. Participating contractors include: Taxi Val-d'Or, Taxi 24, Autobus Maheux Ltée, and la Commission scolaire de l'Or-et-des-Bois (website 2009). (Jean Breton 2009, website 2009). The Cities of Victoriaville and Arthabaska, and the parish municipality of Sainte-Victorie-d'Arthabaska were amalgamated to form the City of Victoriaville-Arthabaska in the fall of 1993. The city was renamed Victoriaville 19 August 1994. City service between Victoriaville and Arthabaska (3 km). Sold to AV 1954. (Jean Breton 2009). Private operator within Victoriaville and between Victoriaville and Arthabaska ( Transit Canada 1976). AV part of the Autobus Tradition group (JM 1997). City service abandoned circa 2002. (Jean Breton 2009, Dawes et al. 1972, RS, pb96). Taxi-bus service. (Jean Breton 2009, website 2009). Granby transit operator received a permit to operate city service at Waterloo in 1966. End date of local service unknown, but may have been in 1988. (Jean Breton 2009). Copyright ©1989-2019 David A. Wyatt. All Rights Reserved.